Henry Lupa made his vision for a zoo become a reality. In its literature, Ludlow’s Lupazoo is described as “a conservation and education institution demonstrating the value, beauty, and interdependence of all living things.” In simpler terms, the game farm opened four years ago is a promise kept by Henry Lupa, a Polish émigré who told his young children nearly 30 years ago that when he had the resources he would build a park with animals to enrich and educate the community. It took considerable patience, hard work, and research to make the dream reality, but Lupa was true to his word. Henry Lupa has a soft spot for the white-tailed deer. There are many reasons why, but primarily because it is with one of these docile animals that the remarkable story of the zoo that bears his name really began. Lupa, a Polish émigré who had long desired to create a zoo (more on that later), began dabbling in the early ’70s with a small, backyard collection of animals that started with a deer called Betsy. One incident involving her has stayed with him for more than three decades and hits squarely at what exactly it is that motivates him. “I had a little enclosure for the deer, and one day I was coming home from work to feed the deer, and I saw a car near the pen. I saw a woman and a young boy, who was screaming and crying,” Lupa recalled, using heavily accented English. “The woman told me that the boy was abused by her husband, that he was 4 years old. He was shaking and did not speak. She told me she did not have money to take him to a doctor to cure him. The boy returned on several occasions to the Lupa property off Nash Hill Road in Ludlow, getting better over time. His progress helped steel Lupa’s resolve to build a zoo, a promise he made to his own children not long after arriving in Western Mass. from his native Krakow in 1965. It took more than 30 years to make the dream reality — with hurdles including everything from the financial commitment to the laborious process of obtaining a license from the U.S. Dept. of Agriculture (USDA) in 2002. Looking back, Lupa said that at times he became frustrated with the slow pace of progress and the sheer volume of oversight, but it has all been worth it. Indeed, the level of pride is palpable as he conducts a tour of the facility, which is literally in his backyard — his residence abuts the 56-acre parcel he purchased for his park. Lupa knows each animal by name (both common and proper) and reputation. He also talks at length about the living quarters, diet, and any special needs, habits, or behavioral traits of the resident in question. Lupa has plenty of time to observe the monkey and the hundreds of other zoo residents. 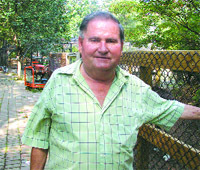 He is essentially retired from the construction company he started a few years after arriving in this country and devotes most of his time to the zoo. This is a family business, he explained, noting that his son Stanley and daughter-in-law Carla manage the venture known as Lupa Game Farm Inc. — one of the few nonprofit, privately owned zoos in New England. It receives some support in the form of donations from individuals and businesses, but most of the funding comes from the Lupa family, which keeps admission costs low ($5 for adults) and admits children under 12 and all those with handicaps free of charge. This is just part of the zoo’s broad mission to educate, said Lupa, noting that to do this it must continue to expand its offerings — and its population. Only 15 of the 56 acres Lupa acquired years ago are now being utilized, meaning there is ample room to grow. For the immediate future, Lupa said he would like to add some exotic cats, perhaps some ocelots or bobcats, and is seeking corporate help to make that happen. This issue, BusinessWest looks at how, by trying — and doing — his best, Lupa has created a truly unique center for learning. Pausing at an area set aside for large, flightless birds, Lupa offered a quick dissertation on the ostrich, and a slightly painful one at that. “He could kill a lion,” Lupa said of the six-foot-tall bird now pecking at his hand through a wire fence nearly as tall as the animal. “Not with his mouth, but with his leg; he can kick, and he’s very powerful. That list would include a few young alligators, some of the other birds on the premesis, and something called the ‘African jungle cat,’ a close cousin of the domestic feline but one that has spent many more hours in the gym. Lupa has acquired these and the hundreds of other animals from a variety of sources; some come from other zoos that are closing, downsizing, or selling some newborns. Others come from auctions of exotic animals — Lupa attends two such events in Ohio each year and brought home an albino skunk from his most recent visit. Harvard University donated 10 monkeys of the common marmoset variety, and one of the alligators came from a local college after it confiscated the reptile from a student. But while the question of how the zoo’s population – which now includes Himalayan bears, yaks, kangaroos, 20 species of monkeys, and more than 300 varities of birds – has been assembled is intriguing, the why is what makes this story so fascinating. Lupa’s specific motivation was to create a facility that would give young people, especially those with handicaps or from poorer families, a place to go. He vowed to his wife and three sons that when he had the financial wherewithal to do so, he would create a zoo. The educational and healing qualities of a zoo were demonstrated in that chance encounter between Betsy and the young boy. Lupa eventually acquired the needed resources through the growth of his entrepreneurial venture, N. L. Construction, which specializes in commercial projects, including schools, fire stations, and other municipal buildings. That background in construction has helped Lupa as he’s gone about the task of creating living quarters for the zoo’s population — work he describes as a labor of love — and he has used left-over building materials and some donated labor from his employees, many of whom are from Europe, to build those customized homes. When asked about the assorted logistics of creating a zoo and the business aspects of this venture, Lupa said it takes much more than mere love of animals to make such a facility work. It takes research, patience, hard work — and some capital. Lupa said he started with a small petting zoo, with Betsy and a few other animals. He was advised to move on to goats and other farm animals to show that he could effectively care for a small, diverse collection. Upon passing that test, he graduated to exotic birds and different species of animals, building a portfolio, as well as the trust of the USDA, in the process. When designing and building facilities for the zoo’s residents, Lupa works to create enrichment for those on both sides of the fence, or glass. For example, the giraffes’ home includes a set of stairs and a landing, enabling visitors to attain the same height as the animals, and to actually reach out, feed them, and touch them. Visitors can get even closer to a pot-bellied pig named Daisy, who can be found, usually sound asleep, on the floor in a building that houses monkeys, reptiles, and other assorted residents. “She’ll probably live forever,” joked Lupa, as he tried, unsuccessfully, to rouse the animal from slumber, “because her heart probably beats twice a day. And such introductions are a vital part of the zoo’s two-part mission — to entertain and, especially, to educate, said Lupa. He noted that the facility has a theater for educational programs, a highly interactive Web site, and several initiatives to promote awareness on conservation, the environment, and even alternative fuels; the zoo runs on bio-diesel. Fun learning would also describe Lupa’s long journey from conceptualizing a zoo to making his a reality. He told BusinessWest that he has visited dozens of zoos and has brought home concepts and inspiration from each of them. As he offered the giraffes another bag of treats, Lupa recalled the story of an elderly woman from a local nursing home. Many similar, if less emotional stories have been scripted thanks to this visionary’s generosity and determination to create a center for learning and, in many cases, healing. To make a long and truly wonderful story short … Henry Lupa kept his promise.